Just like Proust, I had an episode of "involuntary memory" last week. It wasn't the taste of a madeleine cake dipped in tea that brought memories flooding back - it was a song I heard while I was in Wilkos buying some finings to clear my plum wine. I heard this song on the radio. It got into my head and I knew that I knew it from somewhere - but I couldn't think who it was. It took several days of it going round on my head before I googled it and tracked down exactly what it was. It went "She comes in colours everywhere, she combs her hair, she's like a rainbow" The internet kept telling me that it was a Rolling Stones song - but I knew it from the 1990s as it was bringing back memories of working at the Leek Road Library of Staffordshire University around that time. Then, at last I tracked down the version I knew and loved back then - by World of Twist - via the Guardian who were reviewing the band's debut and only ever album Quality Street (from 1992) - which has now been extended and will be re-released on November 25th. How strange is that? I have it on pre-order now :-) How could I have forgotten how wonderful it was? ﻿﻿﻿﻿﻿﻿In more recent news - I've been to the Vue Cinema in Newcastle twice his week. The first time to see the new Thor film in 3D - which was pretty enjoyable. We have been watching all the Avengers films in order - so we are completely up-to-date now. The other occasion was the polar opposite. We went to the first ever live simulcast from the RSC in Stratford to cinemas round the world. It was Richard II starring David Tennant - which was a sold-out production so we had no chance of seeing it in the flesh. This was a pretty close second though - from the moment we got into the cinema we could see and hear the audience in Stratford. It made us feel like we were there. Of course we had the added advantage of close-ups during the action and interviews with the director and principal actors before it started and during the interval. It was fantastic! I had LOVED Ben Wishaw's RII in BBC2's Hollow Crown series - but DT was equally as good, although very different (Cool hair extensions - he had longer hair than Thor!) . 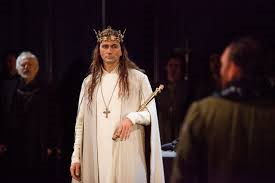 It is strange that I had never seen or even read Richard II before - and this year I've seen it twice. Love the poetry - it is becoming one of my favourite Shakespeare plays. Nathan and I are currently watching the whole series of Breaking Bad (I know - we are really up with the times - we start just as the whole thing finishes!) 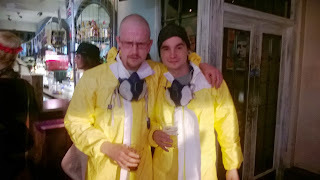 I couldn't believe how good these two looked - just like the two main characters Walt and Jesse. I made N go over and ask if he could take a photo. They seemed very happy about that! I don't know who they were - but fantastic effort chaps! Saturday we were determined to go for a walk despite the wind and rain! 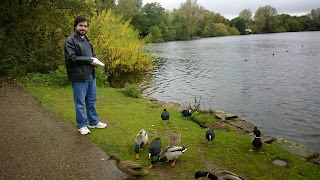 We went over to Westport Lake and popped into the Visitors' Centre to purchase some duck food. We'd read on the website that bread isn't good for them so we wanted to keep them healthy! Armed with our two paper bags of pellets we walked all round -I kept my hood up all the way! Whenever we stopped at the edge we soon gained an army of duck fans eager to see what as in the rustling bags in our hands. Eventually they were swimming round the lake following us - to see where we stopped next. 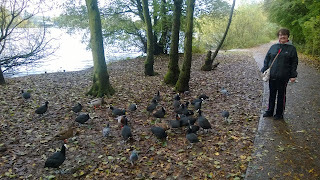 I have to say that Coots really are not nice to each other. There was so much fighting and pecking of eyes! Why can't they just share? 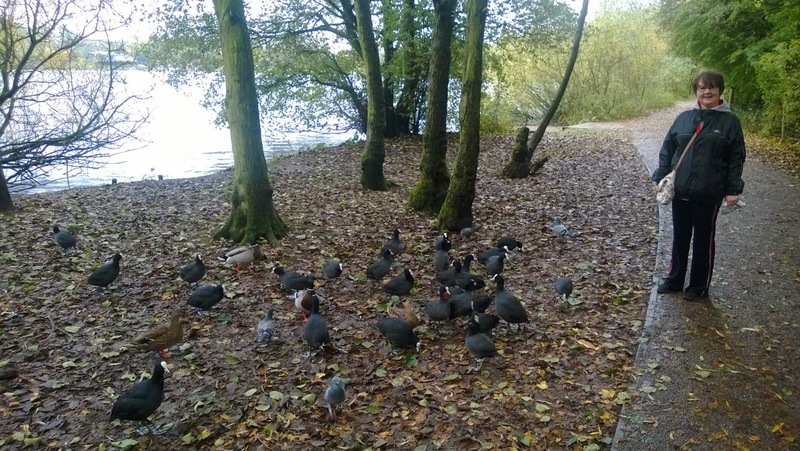 One took so much time chasing all the other Coots away that he let the Mallards and Seagulls snaffle all the food. Silly Coot! We were very excited about Saturday night - as we were going to see Morgan and West - those amazing time-travelling magicians we saw in August at the Edinburgh Festival. We were so happy they were calling in at Stafford on their Autumn Tour. I think it is their first tour hopefully the first of many. I cannot stress enough how much you all need to see them! They were fab in Edinburgh and they did fool Penn and Teller on their Fool Us challenge. I wasn't sure if we'd see some of the same tricks - but no! It was all completely different stuff. The place was pretty full with a good mixture of ages. Lots of children and some grandparents too. 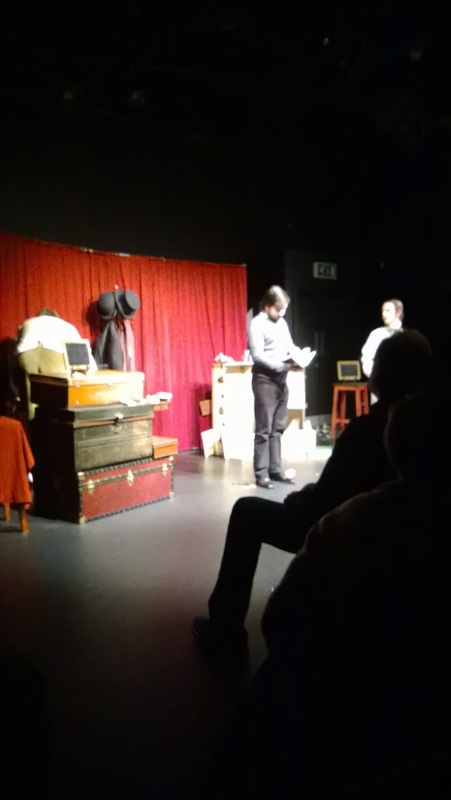 The announced that the show was interactive and if they liked the cut of our jib they may well ask us to come on stage to help out with the magic. Sounded intriguing! N with Mr Morgan and Mr West after the show. 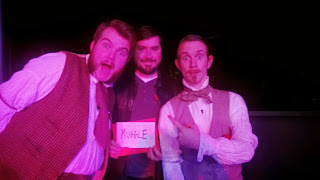 I have to say that Mr Morgan and Mr West are thoroughly nice chaps. I'm back to work tomorrow - just one more treat before I go back. We are off to a new pub quiz tonight. It is at the Cricketers in May Bank - and thee are cash prizes. Wish us luck! !